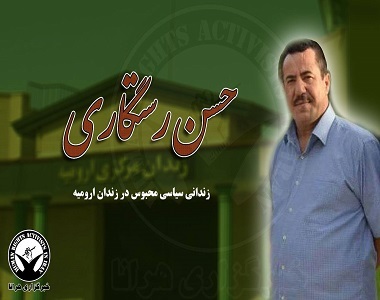 HRANA News Agency – Hasan Rastegari Majd, Turkish-Iranian citizen and political prisoner of Uremia central prison, was sentenced to another one year in prison on charge of propaganda against the regime. This sentence was issued while the attorney general had dropped the charges, but the prosecutor appealed and he was tried again. According to the report of Human Rights Activists News Agency (HRANA), Hasan Rastegari Majd, political prisoner of Uremia prison and dual-citizen of Iran and Turkey, was sentenced to one more year in prison by judge Shaikh Loo, on charge of propaganda against the regime. Need to be mentioned, by the influence of Hossain Gharebaghi, head of the 1st & 2nd psychotherapy wards, Mr. Rastegaro who is being held between normal prisoners, was beaten by them and as punishment was transferred to solitary confinement for a week. This political prisoner was beaten by the same prisoners, with collaboration of the new head of the wards, Mr. Safari multiple times and was sent to solitary confinement. After these incidents a new case was opened for him. This source emphasized, “During all of these transfers to the court and back to prison, Mr. Rastegari was harassed and humiliated by prison guards, prison security officers and head of prison, Mr. Safari”. Need to be mentioned, this dual nationality citizen was beaten by security forces last June and some of his teeth broke then. Mr. Rastegari is also suffering from eye sight weakness and a broken hand. Hasan Rastegari is 43 years old and was arrested on October 27, 2014. Mr. Rastegari was charged with disrupting the public order, acts against the national security, and cooperation with conflicting Kurdish groups, and sentenced to 15 years in prison by the revolutionary court of Uremia. This sentence was confirmed in the appeal court.